On Thursday, March 5, 2015 I got to do one of my favorite things. I went with Bonnie to a Major League Spring Training Baseball Game. 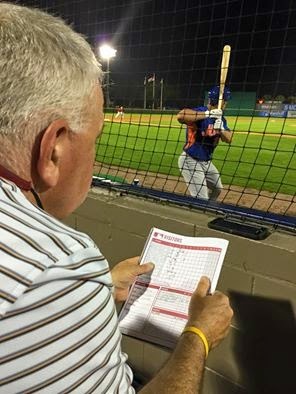 It was a game between the New York Mets vs. Washington Nationals at Space Coast Stadium in Viera, FL. ﻿Bonnie and I got to the stadium about a hour before the game to buy tickets. We went to the ticket window to buy our tickets to find that they just opened-up seats in the first row right behind home plate. So we got two seats in Section: Batter, Row: 1, Seats 40 & 41. To me Spring Training Baseball is the official start of the spring time season. 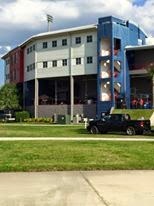 Space Coast Stadium in Viera, FL is the spring home of the Washington Nationals. The Nat's are the current N.L. East Division Champions of the past 2014 Baseball Season. 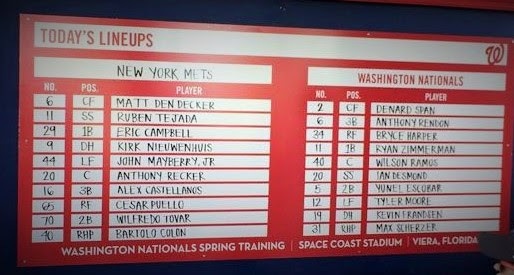 The New York Mets play in the same division as the Nationals and are in a "Rebuilding Phase" with lot's of younger players mixed in with some seasoned veteran players. It was a lovely afternoon/evening for a ball game. The official start time was 5:05 PM and the sun was shining and the temp. was about 84 degrees. Here is a photo of the two teams starting lineups for this game. The Nationals starting pitcher was #31 Max Scherzer a free agent who signed with Washington from the Detroit Tigers this past winter. 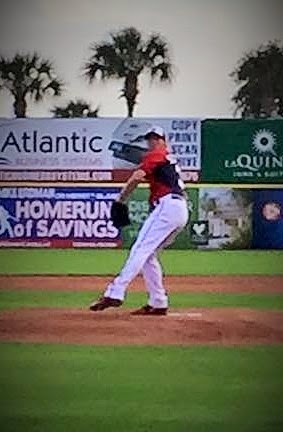 Scherzer was the past 2013 Cy Young winner and he is also a All-Star pitcher. The Mets started #40 Bartolo Colon a seasoned veteran pitcher of many fine baseball teams and seasons. Both pitchers started the game off well. No hits or walks and they both had 1-2-3 outs in the 1st inning. 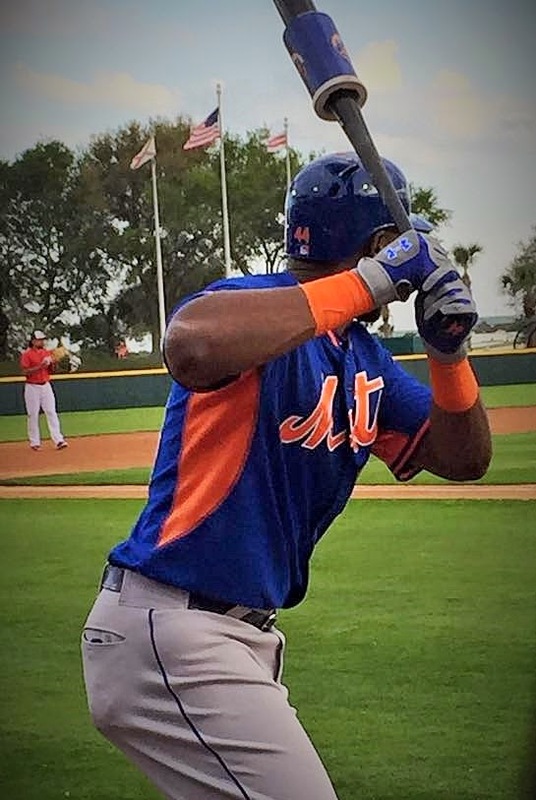 But in the top of the 2nd inning with one out #44 John Mayberry Jr. of the Mets hit a homerun to deep left field off of Max Scherzer for a 1-0 Mets lead. In the 3rd inning the Mets added to their lead by scoring three more runs. With a two run homerun by #29 Eric Campbell and a run scoring single by catcher #20 Anthony Recker. All of the runs came off of Nat's pitcher #57 Tanner Roark. 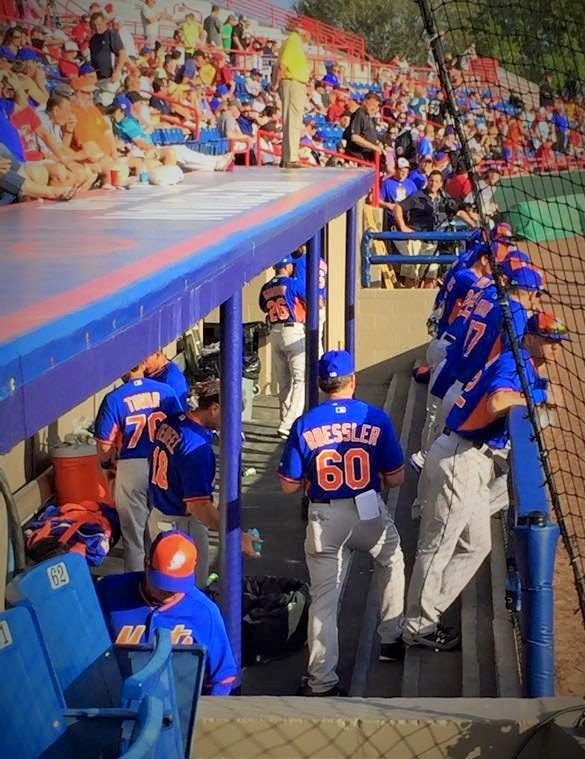 So the Mets had built a 4-0 lead going to the bottom of the 3rd inning. 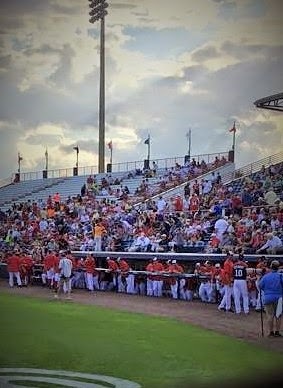 But the Nat's came right back into the game by scoring two runs in the bottom of the 3rd inning with a "Hit-By-Pitch", a RBI double by #12 Tyler Moore, and a RBI single by #19 Kevin Frandsen. So after just three inning the score was Mets 4 - Nationals 2. The Nat's scored again in the bottom of the 4th inning on a two out RBI single by center fielder # 17 Eric Robinson. So now it was Mets 4 - Nationals 3. The score stayed the same till the bottom of the 7th inning. With a run on 1st base and no outs, first baseman #18 Kila Ka'aihue of the Nat's hit a go ahead two run homerun to deep right field off of Mets pitcher #47 Cory Mazzoni to take the lead for the first time in the game. Score now 5-4 Nationals. The Mets had just one more chance to tie the game in the top of the 8th inning with a run on 2nd base and two outs, pinch hitter # 2 Daniel Herrera lined out hard to pitcher #62 Eric Fornataro to end the inning. Nat's pitcher # 64 Blake Treinen came in the game for the top of the 9th inning and he got the three out save to end the game. So the final score was the home team Washington Nationals winning 5-4 over the visiting New York Mets. Winning pitch for Nat's was # 30 Aaron Barrett with # 64 Blake Treinen getting the save. Losing pitcher for the Mets was # 47 Cory Mazzoni. Time of the game was 3hrs and 10 min. long and both teams used seven pitchers and nine spare/sub players in this game. Attendance total was 5436 people. So in the end Bonnie and I had a great evening. We got to see a lot of good young ball players from both teams in this game. 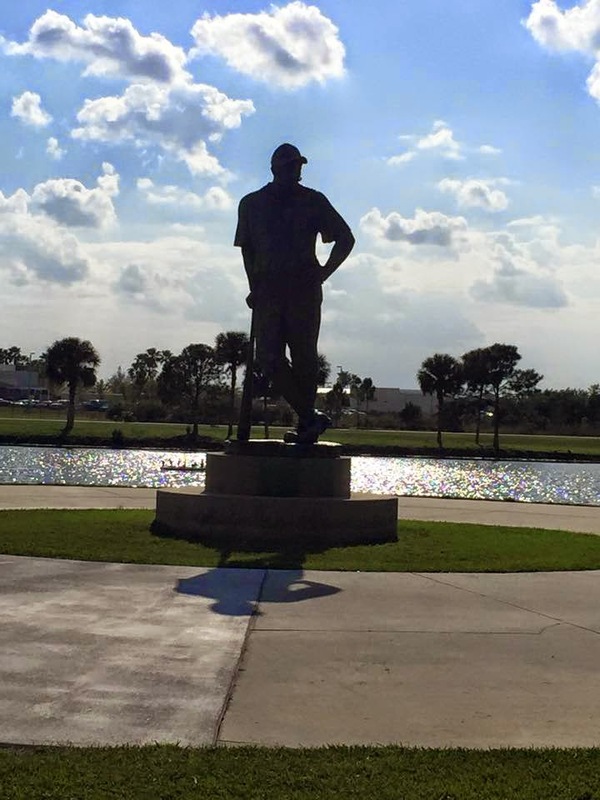 We had a great time enjoying a great game called "Baseball"
Golf Trip with golf buddies.